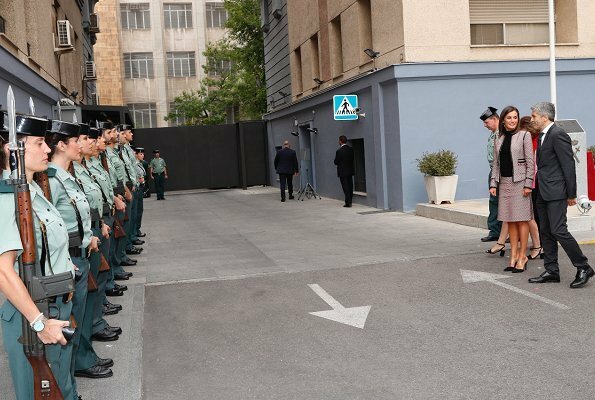 On the occasion of the 30th anniversary of the entry of women into the Civil Guard and the 25th anniversary of the entry of the first woman in the General Military Academy as a Corps officer, celebration events were held at the General Directorate of the Civil Guard in Madrid. 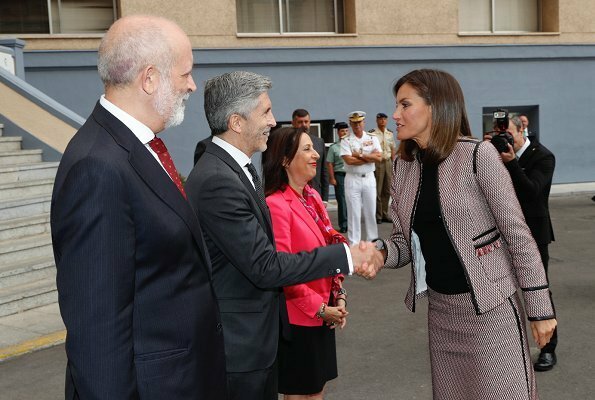 On September 26, 2018, Queen Letizia of Spain attended the celebrations. 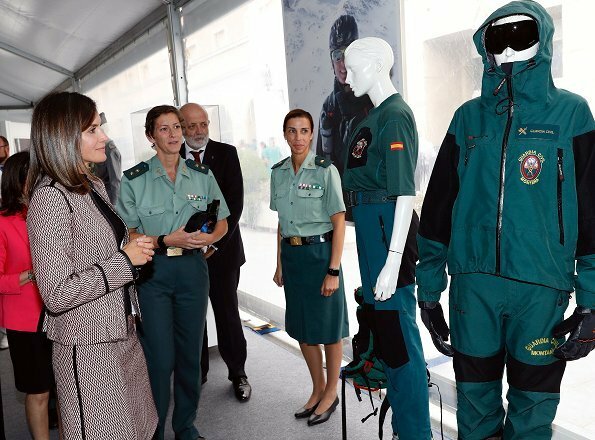 Guardia Civil is a military law enforcement agency which ensures the security of the public and performs both civil and military police services. Special shoes... but in a nice way. Boring clothes. She should be careful about whatever she is doing to her face. It's starting to look a bit bizarre. This suit is worthy of many outings. It is one of those classics that never goes out of style. The shoes are at odds with the outfit, but she still looks professional. It's great to see these ladies excel in this field. The face comment is unnecessary and petty. Her choice. I agree that the comment about her face was unnessary. Perfect jacket and skirt for an active Queen. I don't like the shoes. A clutch would be fine. 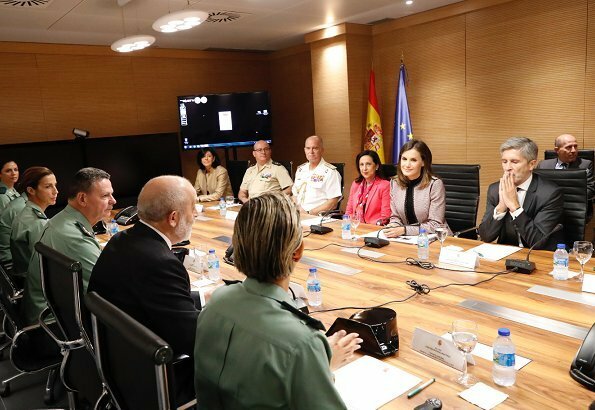 Q Letizia looks lovely again today.Don't care to much for that plastic strip but nice shoes anyway. Very odd combination, the suit screams fall/winter professional look and the shoes are more for a night summer event. She needs a bag and for accesorie a brooch. 15C in the morning, 30C in the afternoon, very difficult to dress in Madrid in autum. We mix things. Lovely tweed costume. Her shorter hair look good. Agree that her shoes look off with this kind of suit. How my knee hurts when I see her with those ugly shoes knees over straightened. She practises yoga, no knee hurts at all, you should try it. Anonymous; I happen to have joints which go over all, such a nice thing when I was young but leads you for sure to big joint problems at older age, especially when having all the time over high heels. Just got artificial knee, MY knees hurt to see her not her knees. Try to learn to read. Muy grande la Guardia Civil. 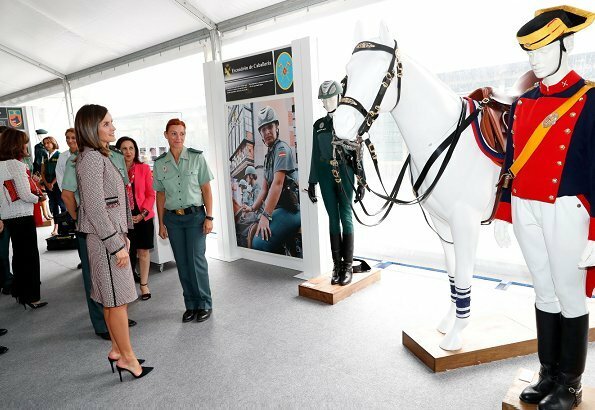 La Reina rinde homenaje a sus mujeres y sus extraordinarios servicios. She has worn these shoes many times. They are not new. I think for this time of the year, I would prefer a full pump, but there is nothing wrong with these shoes. 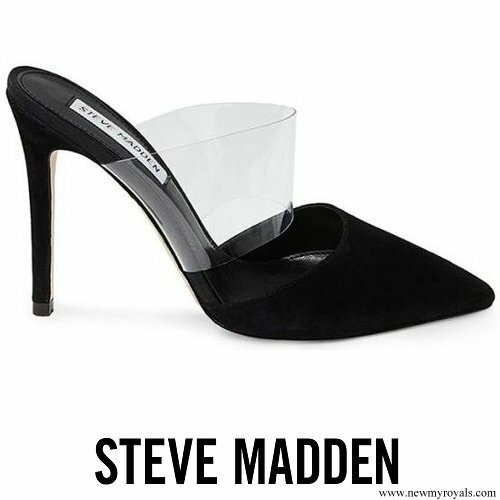 And she certainly wouldn't wear them as much as she has if they weren't comfortable, as has been suggested. Her HB suit is classic and will serve her for well. Nice to see a tweed suit with a modern twist. The esemble is not talking with the shoes. The last picture with the black shoes is my favourite. ...ah no closed pumps...how unfortunate..